▲ It is AlphaGo, an Artificial Intelligence developed by Google Deep Mind. 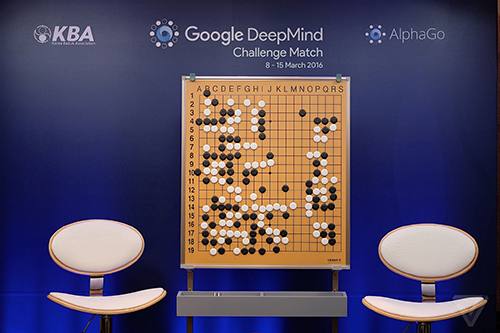 Eminent baduk player Lee Se-dol surrendered to “AlphaGo,” an Artificial Intelligence program developed by Google DeepMind. This amazing performance from “AI” has led the IT industry to start a new wave. With astonishing results of Artificial Intelligence research, Information Technology is now regarded as the key to the future development of society. Nations all over the world are very passionate about research and investment in the IT field as well as Artificial Intelligence, one of the biggest issues of the future era. Korea has long been called as the “IT leader,” with successful companies and competitiveness in exports. The country has been ranked first for Memory Semiconductor production rate, and has companies that outstood in the Information Technology field. Samsung is the first in hardware sales, with LG in the fourth and Hynix in the 43rd. The national Smartphone ownership rate has reached 86 percent, and Internet use is at almost 100 percent. Korea’s fast Internet speed and high production rate in electronic devices have given other countries the image of Korea as a highly developed country. The field of Artificial Intelligence was predicted to be the biggest story of Information Technology in 2016. “AlphaGo” showed a surprising result and potential of the AI field, and researchers are suggesting that AI will be applied to robots, self-driving cars, and Internet of Things (IoT) among other fields. Many countries are on an active mission to develop such industries. China has announced a project called, “Made in China 2025,” the nation’s most comprehensive and ambitious industrial plan. It is designed to transform China from a manufacturing giant into a world manufacturing power, including the IT field. Numerous companies from China, such as Huawei, Lenovo, and Shaomi, already have high worldwide market shares. Japan provides well-prepared education and research in science. This country is well known as the leader of key components in IT and has highly developed Artificial Intelligence robots. Fourty-three numbers of companies clearly show the status of the U.S. in IT field, having outstanding manpower, leading technology in software development and original technology. Above these current positions, nations and companies are continuously trying to enlarge and develop their country’s industry. The European Union has announced an investment of one billion US dollars in human brain research, and the United States has started a research project called “Brain Initiative” with three billion dollars of investment. Toyota announced that it will invest three billion dollars over ten years, establishing an Artificial Intelligence research lab in Silicon Valley. Google is planning to invest 28 billion dollars over 14 years only for the Artificial Intelligence. Compared to the movements of other countries and companies, Korea is just at the beginning. Despite the efforts, other nations and global corporations are pouring efforts into IT industry, while the Korean IT industry has shrunk due to fragile infrastructure and dominant trends in IT market. According to the International Institute for Management Development (IMD), Korea ranked 44th out of 61 countries that researched for brain drain index in 2015. This is because a number of high-quality workers in Korea has lost to other 43 countries which ranked above Korea. Not surprisingly, most Koreans in the IT industry do not work for the development of original technology; even if they do, it is not in Korea. Most of the workers fly to the U.S. or China for better conditions and environment for their research, directly leading to “brain drain” in Korea. Others who remain in Korea are concentrated in the game industry, since it is the most profitable job. Neither of these cases benefit Korea’s IT industry. AI can be as victim here. It could not be marketed as a product in a short time, nor was the government has interest in it. Naturally, not many Korean people in the IT industry or outside of it either were interested in AI. The problem was not revealed until recently when AlphaGo was introduced to the world by defeating Lee Se-dol. Since AlphaGo’s impressive appearance, the Korean government and Korean corporations have turned their interest in AI as well. To improve Korea’s IT industry, the government announced several plans regarding investment in original technology. The Ministry of Science, ICT and Future Planning and the Ministry of Education introduced work plans for this year focusing on revitalizing and supporting projects related to ICT, science and biotechnology. They have loosened the restrictions for researchers and promised a better environment and flexible conditions regarding research and experiments. They have increased both the period of research and the amount of capital invested. Additionally, the government announced that they would invest in nine other original technologies as well as virtual reality, cloud, and ICT. The IT industry including AI is gaining all the attention of the world as experts predict that in upcoming years, machine will take over the majority of the work humans currently do. Since Korea do not have a long history in the field of science and lack conducting research on original technology, the Korean IT industry adopted the fast follower strategy, focusing on copying, digesting, and remodeling. This led Korea to become one of the leading countries in the IT industry, and, in some field, it still retains this seat. However, recent changes in trends in science and technology have revealed the limits of the fast follower strategy; quickly adopting confirmed foreign technology. To keep the lead, Korea needs to achieve more in the area of original technology.